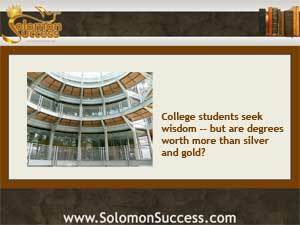 In proverb after proverb, King Solomon tells us that wisdom is to be sought after as gold or silver. To do that, wisdom seekers need to acquire knowledge, seek out wise counsel and accept instruction from those with greater experience and insight. “To know wisdom, and instruction; to understand the words of prudence, and to receive the instruction of doctrine, justice, judgment and equity,” he says in Proverbs 1: 2-3. But for today’s college students, the gold and silver it takes to seek a college degree can jeopardize their financial future – and the economy — for years to come. With more alternatives available than ever before, a growing number of economists and educators are beginning to question the worth of the traditional four-year college degree. As we’ve reported in previous posts here, it’s no secret that ballooning student debt can force these debt-ridden graduates to put off many traditional life milestones like buying cars and houses. Some never get there – loan defaults damage their credit so severely that they can’t qualify for these other purchases at all. That’s why, since recent studies reveal that over two thirds of graduates from traditional four year schools finish their college careers in debt, 51 percent of the students surveyed by Forbes said they’d rather work after high school than go to college. Those responses come at a time when many colleges are also facing drops in enrollment due to rising costs. And they lend new weight to an old argument: in today’s information-driven world, with its fragmentation into millions of niches and sub-niches and opportunities for entrepreneurship. Is the traditional college education really relevant anymore? Those who say it isn’t point to the fact that a student committing to a major today may find that the field – and the job outlook— will have completely changed by the time graduation rolls around. And there’s no guarantee of finding a lucrative full time job that allows for paying down loans. Many of today’s most successful individuals have no college education at all – or their college degree has no connection to their successes. And the rise of alternatives to traditional colleges, such as community colleges that offer “starter” degrees with hands on training aimed at employment and online colleges that provide niche-specific training in high-demand fields such as information technology and forensics, allow students to get a more affordable –and relevant – education that gets them into the working world more quickly. For the entrepreneurially inclined, mentorship and networking take the place of the traditional alumni associations and societies that used to provide channels for job seekers. On the Internet, qualified professional advice is just a clink away around the clock, too. Defenders of the traditional four-year college experience say that a degree opens doors to higher paying work and offers students a chance to mature. But those high paying jobs don’t pay out immediately for new grads and are out of reach for many – hence the cliché of the PhD serving burgers at McDonalds. And the burden of student loan debt gobbles up a portion of that income anyway.